Advanced Mini Piling Systems Rigs, are all fitted with cages and safty features that comply with currant HSE legislation, are fully Certified, and come with a fully CSCS qualified Operators, Banksman, and Slinger Signallers. Pilings Rigs to be hired will be supplied with all relevant equipment at request of hirer. For more information on our Piling Systems and Services or helpful advice please Contact us. 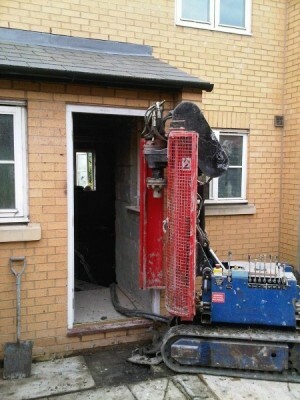 These versatile Piling Rigs are purpose built for restricted access locations. They can perform Piling operations internally as they have retractable rubber tracks, allowing them clearance through a standard doorway, and externally they are highly mobile on small open site work, supplied with four outriggers giving support on soft, uneven ground. *25m to 50m of Hydraulic umbilical lines. *Augers and all necessary items, Pins, Catcher/Fork, Retriever… ect. *Fully mobile power pack with road tyres.